The Translation Triangle « Traduction Proteus Inc. Imagine a Venn diagram. (Yes, I know, that’s basically asking you to remember grade 7 math, but it could be worse. I could have asked you to solve for X). 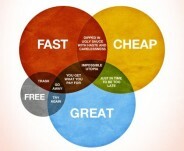 Three circles that, for the sake of our exercise, we’ll label Quality, Time, and Cost. The area where all three intersect would pretty much represent the ideal for any client—the Shangri-La of translation if you will. In this management concept, also known as the Project Triangle or the Value Triangle, which incidentally is not exclusive to the translation industry, it is common knowledge that a client can typically only have two of these three attributes. Let’s break them down as they apply to translation. Quality: Translators worth their salt take great pride in the work they produce, from the humble press release to the blockbuster novel. A great deal of research goes into the final product, and numerous rewrites and reformulations are often involved. Translators tend to agonize over things like punctuation, hyphenation, and conjugation—the little details that no one notices until the writer or translator gets them wrong. Time: Translators are ruled by deadlines. Sometimes they’re generous, which is a rare treat; generally, they’re reasonable, which is appreciated; often they’re tight, which is a challenge; and occasionally, they’re completely ludicrous, which just causes one to shake one’s head in disbelief. What applies across the board, however, is that professional translators make it a point of honour to always meet their deadlines. Cost: There are many factors involved in the cost of a translation, as any translator will tell you: word count, complexity of the subject matter, deadline, formatting, software used, amount of repetition in the text, etc. Experienced translators know the value of their product and will not undersell themselves, while always endeavouring to strike a balance with the client. 3) You can get a translation done quickly and cheaply, but it will likely be mediocre at best and total garbage at worst. Ultimately, only you can decide which element is more important to you. Just remember, something has got to give! For the best possible balance between Quality, Time, and Cost, give us a call at 514-903-9987.